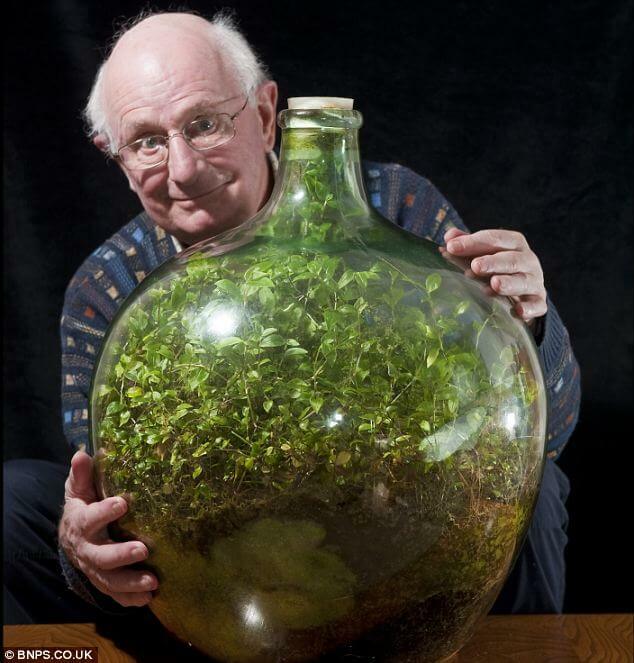 The idea of a bottle garden is to create a world in microcosm. It will have its own special habitat and should require little maintenance, writes NIGEL COLBORN. First choose a glass container. It will need a wide neck for easy access and to look attractive. A goldfish bowl is ideal, or for children, a big jam jar might do. You’ll also need some good-quality potting compost, shingle or coarse grit and, of course, the plants. Use a large spoon to insert a layer of grit into the jar and cover that with compost deep enough to accommodate the plant roots. Finally, introduce the plants. You’ll need very few and they must be tiny specimens – unless it’s an enormous receptacle. Little ferns such as indoor maidenhair or Adiantum, small varieties of Tradescantia and baby plants of Chlorophytum will all establish easily. Miniature trailers such as ‘Mind-your-own-business’ (Soleirolia) will also flourish. Move each plant gently into position, adjusting them with a stick or with kitchen tongs until you’ve got them where you want them. Adding a final layer of grit after planting will hold the compost down and make your micro-garden look prettier. Water with extreme care (your jar won’t need much) and place the finished mini garden in a well-lit spot, but not on a hot south-facing windowsill. After that, he greased the bung so it wedged in tightly… and has not watered it since.